work for Blue Balls Foundation, Lexus 'heartbeat'. GPY&R Melbourne and Brisbane took home two awards for its 'Melanoma Likes Me' work for Melanoma Patients Australia. Cummins&Partners founder Sean Cummins was inducted into the AdNews Hall of Fame. Watch his highlights reel here. You can read a profile of Cummins in the print edition of AdNews also out today (4 March) or you can get it on iPad now. Also, a big thank you to all our sponsors who supported this event. Supporting sponsors include Adstream, Adshel, Facebook, IAB, Nova Entertainment, Think TV, Val Morgan Cinema and associate sponsors Bluestar Web, Orchard, Royal Auto, Wink and our Red Carpet Sponsor Bauer Media along with our Creative Partner MJW. Missed the awards? Watch the highlights below. 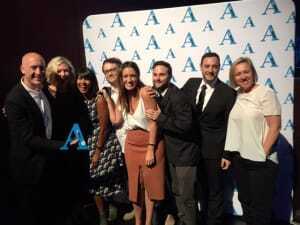 The Monkeys was named the AdNews Agency of the Year last night, alongside winners in every other category. For the full list of winners, see below. The Monkeys also picked up the Independent Agency of the Year and NSW Agency of the Year, and its sister shop Maud was named the Small Agency of the Year. Relative newcomer Atomic 212 took home the Media Agency of the Year award, while Carat was named the Media Network of the Year. M&C Saatchi had a good run picking up three awards. Two for its 'Game of Balls' work for Blue Balls Foundation, Lexus 'heartbeat'.